Enhabit is now one of the few airtightness testing providers in the UK that can provide airtightness testing for Passivhaus and EnerPHit projects, as these require different volume calculations and a more detailed test procedure compared with UK Part L1A Building Regulations. Since last year Enhabit has been offering forensic and compliance airtightness testing for all new build, retrofit and Passivhaus / EnerPHit projects. Our airtightness technician is registered with ATTMA for Level 1 airtightness testing, which means Enhabit can certify the airtightness results for all buildings with a volume of up to 4,000m3. The permeability of the building fabric of all new build properties in the UK must be tested as a requirement of Building Regulations Part L1A. For new properties the minimum requirement is for an airtightness up to a maximum of 10 m3/hr/m2 air loss at a pressure differential of 50 Pa. In practice, most SAP design rates for new build and retrofit properties will be much more stringent in order to meet the energy efficiency requirements – much closer to 3-6 m3/hr/m2 @50Pa. This ensures you have a comfortable and draught-free home that’s not expensive to heat. Whereas Part L1A testing requires the external area of the entire building envelope to be calculated to assess its air permeability, Passivhaus and EnerPHit certifiers prefer to use the total building volume (‘Vn50’ figure) to measure the airtightness of a building. This requires a separate calculation to be completed (an ‘air-changes per hour’ figure), which most airtightness companies are not equipped to do. Compliance testing must be done just before the homeowners move in, once the house is finished and decorated. However, if issues are found at that point it can be impossible to solve them, so Enhabit recommends up to two ‘forensic’ airtightness tests to be conducted at key points during the construction. Forensic testing involves depressurising the property to artificially create draughts through any leaks in the building fabric. These can be detected using a smoke pen or by hand. These are noted in a photographic report and the construction team can then apply remedial actions to fix the leaks as they continue building. Preliminary Forensic Airtightness Test: Once the external fabric airtightness elements are finished but the walls and ceilings are still open (ie, once all windows and doors have been fitted and the building shell is weatherproof). Follow-up Forensic Airtightness Test: Once all service penetrations have been made in the fabric and taped (ie, all electrical, plumbing, ventilation and miscellaneous pipes and cables have been fitted through the walls, floors and roof). 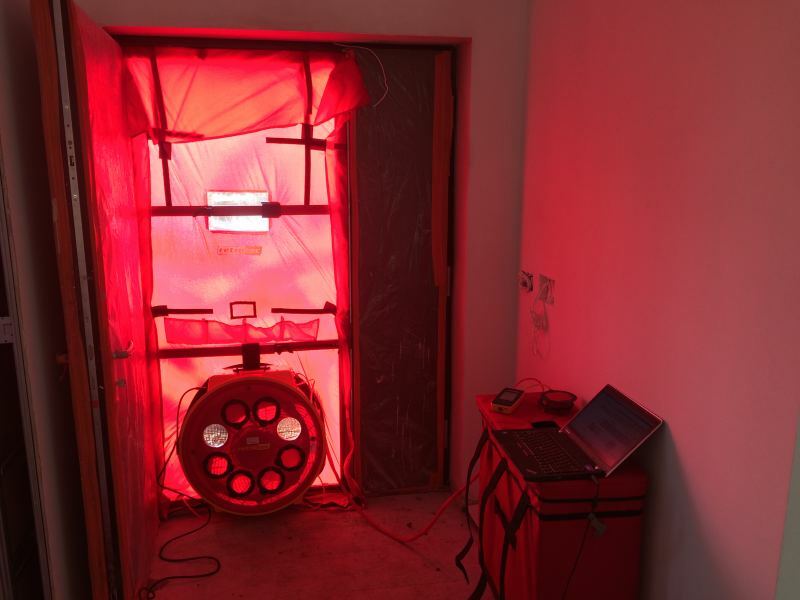 Compliance Airtightness Test: Once the building is finished – this is the compliance test that must be sent to Building Control and/or the Passivhaus certifier. Speak to our team today at info@enhabit.uk.com if you require airtightness testing for your projects. As a special offer, all AECB members receive a 10% discount for airtightness services.